No, I don’t collect Allied ordnance, but this is such a perfect example of an iconic weapon from both WW1 and WW2, well I guess I needed one. 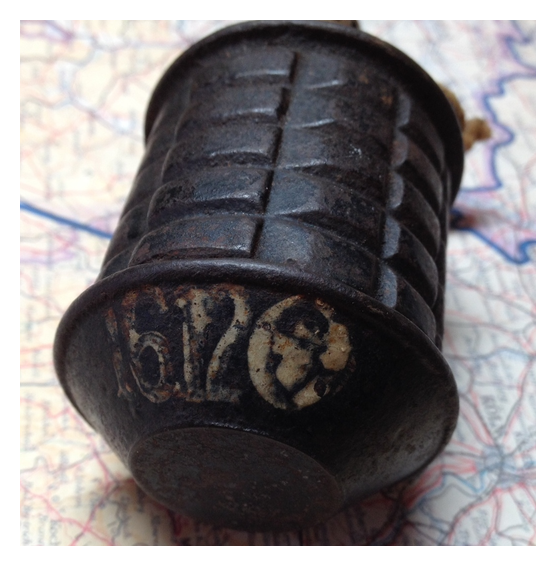 This particular example is a Number 23 Mark II, which places it somewhere between late 1917 and early 1918. The base plug is marked to Moorwood, the manufacturer and indicates its model number. This rather boring little cardboard tube is intended for the German Mod 40 Rifle Grenade (Große Gewehrpanzergranate). This tube is not marked for a manufacturer, just for the model grenade it contains. The grenade can be found here. 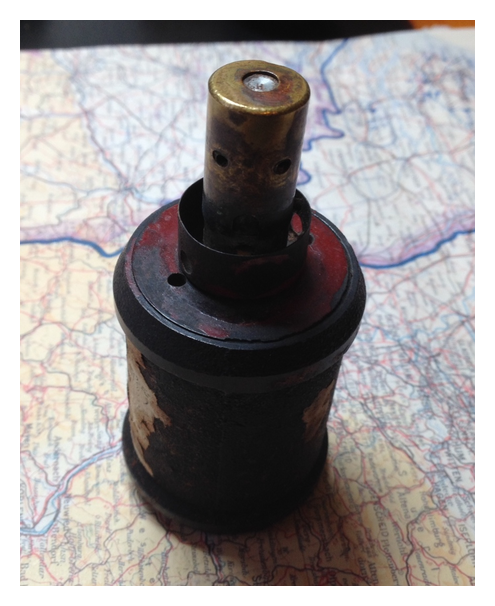 This is the transport container for the German Mod 30 (30mm) high explosive rifle grenade (Gewehrsprenggranate). My friend James is big into ordnance and insists on talking me into buying this stuff. The type-A in me agrees but I have to say that old cardboard gets right stinky. 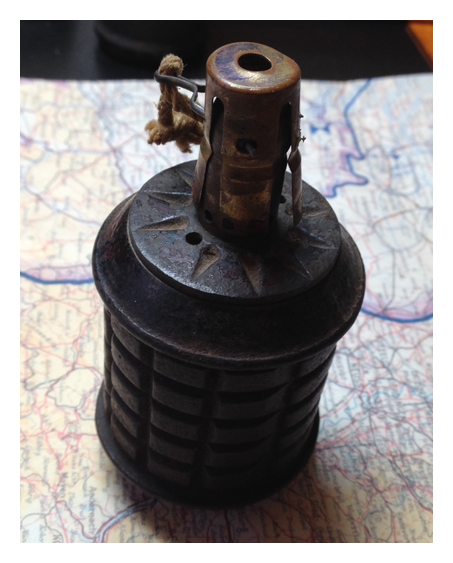 The grenade it held is here. The container is stamped COS 44 for Merz-Werke Metallwarenfabrik in Frankfurt. 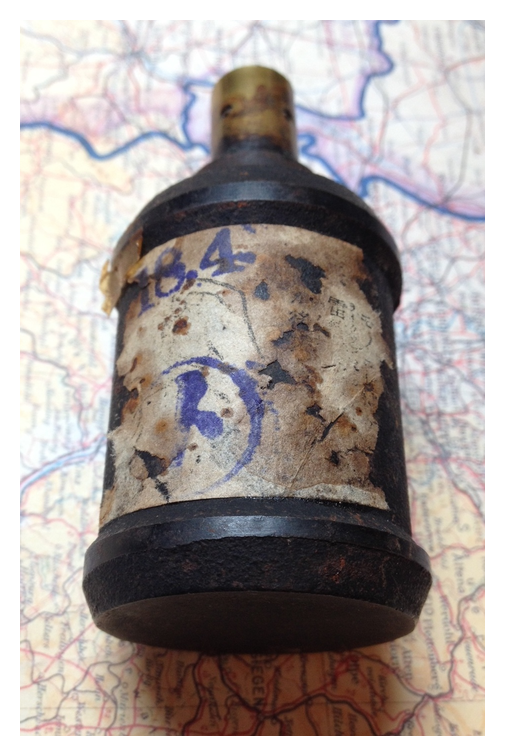 This grenade, the Volkshandgranate 45 is a product from the last months of the war. The body was made out of concrete, mixed with metal fragments, formed in a paper mold. 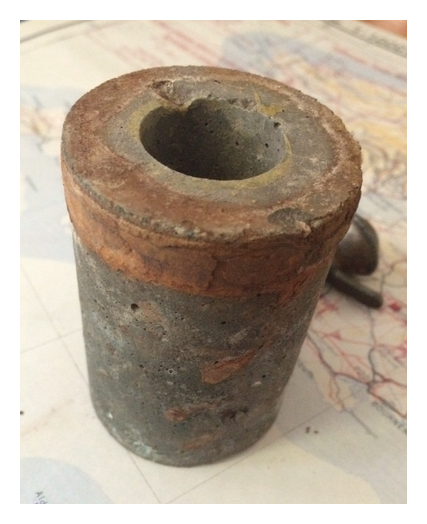 It held a 150gram nipolit charge, held under a metal cover. The charge held a threaded metal adapter, to accept the igniter. This particular one has traces of its original green paint however it appears the metal adapter is lost to time. The Type 99 Hand Grenade (九九式手榴弾 Kyūkyū-shiki Teryūdan), also known as Kiska grenade by the American Army was an improved version of the Type 97 fragmentation hand grenade used by the Imperial Japanese Army and Imperial Japanese Navy SNLF during World War II. The Type 99 was issued as a standard rifle grenade to Japanese infantrymen in the Second Sino-Japanese War and throughout the various campaigns of World War II. The first examples to fall into the hands of Allied military intelligence were captured at the Battle of Kiska in the Aleutian Islands, which gave rise to the nickname of “Kiska grenade” by American troops. 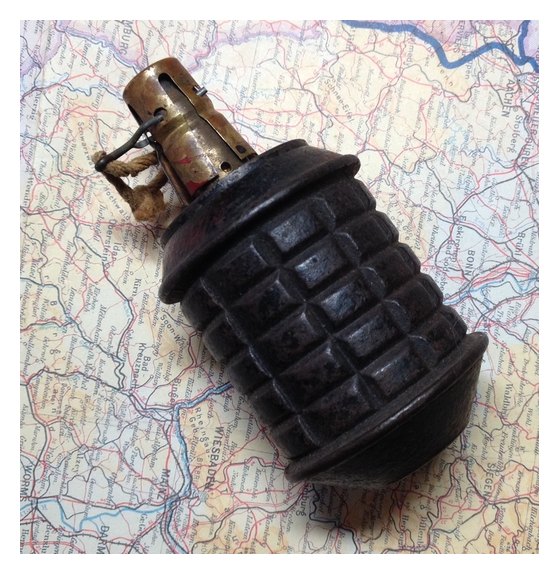 This is a Type 97 Hand Grenade. The Type 97 (九七式手榴弾 Kyūnana-shiki Teryūdan) was the standard hand grenade in the Japanese Army and Naval Landing Forces from the 1936 Sino Japanese War until the end of WW2. 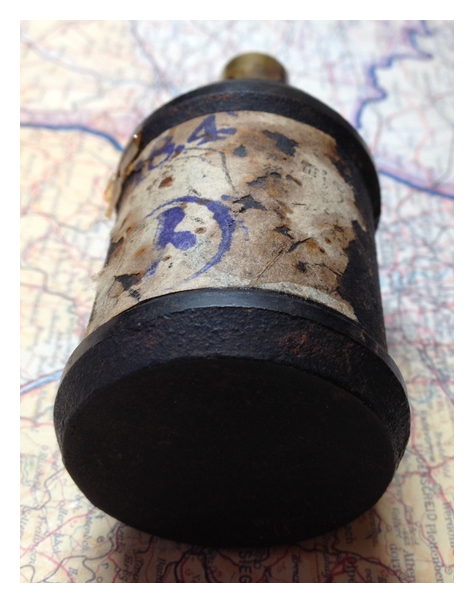 The low power and unreliable fusing on this grenade made it as dangerous to the user as to the target. 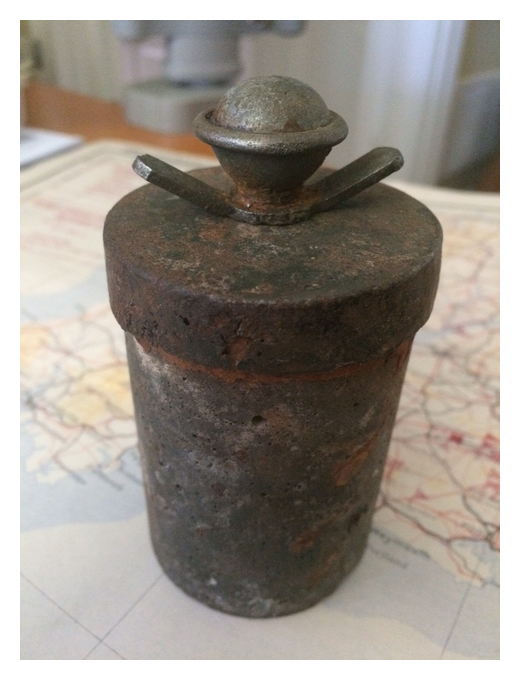 This is a WW1 Imperial German stick grenade called the M1916. It’s an odd design since the base of the grenade doesn’t hold a porcelain ball like the M1917 but rather has a weight that falls out when the grenade is thrown. I think this is a water recovered one with a touch up on the paint job as although the manufacturer “R.C.W.N.” marking is still visible, there is wood loss where the fuse time was stamped and all I can make out is an 8.